Color Shock Decal, outside application. Color Shock Decal, for outside application. Made in the USA. Color Shock Decals are uniquely cut so that only the desired image transfers to your surface. The letters and shapes are free-standing. As a result they have a custom paintjob look rather than an ordinary rectangular sticker look. They look great on the outside of any car/truck surface including tinted windows. Color Shock Decals because everything else is just a sticker! Embroidered logo patch 3" x 3"
HC dog logos Removable Decal. 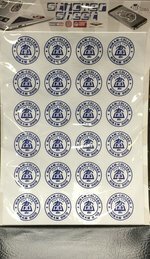 XStatic Cling Decals, for inside window application. Window color shock decal - HC Logo with "Bling"